ROME - After a decade at or near the top of tennis, Rafael Nadal can accept that he's no longer dominating. 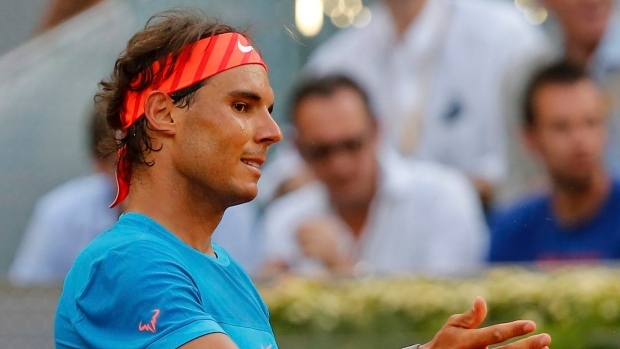 "Obviously today I'm not as good as I (was)," Nadal said Tuesday at the Italian Open. "Life has been fantastic with me. Today I'm not winning as much as I did in the past. Life continues." On Monday, Nadal dropped out of the top five in the ATP rankings for the first time in 10 years — falling to No. 7. He's struggling to get back to his best after a wrist injury and an appendectomy last season. "I'm No. 6 in the race. It's not a disaster," he said, referring to the 2015 standings. Nadal's loss to Andy Murray in the Madrid Open final Sunday was his fourth defeat on clay this year, only two weeks before starting his quest for a 10th French Open title. It's the first time he has lost four matches on clay during the same season since 2003. "You are wrong if you think that the last week was a negative week for me," the 28-year-old Nadal said. "Last week was a positive week for the confidence and a lot of things. Let's see if this week I can improve (on) last week." After a first-round bye, Nadal opens Wednesday against Turkish qualifier Marsel Ilhan. The Spaniard, a seven-time champion at the Foro Italico, strongly rejected suggestions that he should consider removing Toni Nadal, his uncle, as coach. "If things are not going well it's because I am not playing well," he said. "Not because of the coach." Nadal added that he would never fire his uncle. "No. It's not only my decision," he said. "That's a decision of two people, not only one. Don't forget that Toni is more my uncle than my coach. "If in any moment of my career I change some member of my team, it will not be because I am losing or winning," Nadal added. "It will be because there is not enough motivation for one another." Nadal has had the same staff his entire career. "And I don't think my career is a bad career," he said. "If I'm not playing that good today, it's not because they're not doing the right job. "I don't know if I will be with my uncle until I finish my career because I don't know what's going to happen tomorrow," Nadal added. "I cannot predict what will happen tomorrow. But I'm not thinking about changing my coach today."